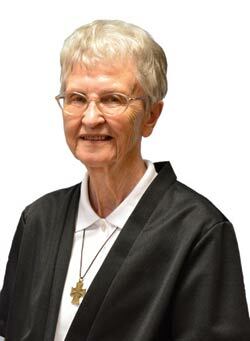 Seventy years as a Sister of St. Joseph! At this time it is rather overwhelming to choose an event that best captures what religious life means to me. My whole life is mystery. God’s mercy and love is always there. Even though there are times when I do not see this clearly! Ere this moment passes, I give gratitude to my family for their continuous love and support and to my community for the spiritual and educational advantages given me over the years. I am grateful for having had the experience of teaching kindergarten through eighth grade in many states. However, deep inside me my dream was not yet fulfilled. Again I pray that the Lord help me to know that I am here but for a moment more. Thanks to Vatican II, changes came that provided the opportunity to pursue my dream to live and teach in the inner city. trust and resilience that faculty, parents and students showed in their every day living. Retiring from teaching, I joined the Senior Companion Program, and experienced visiting and caring for the elderly. Their wisdom, sense of humor and acceptance of aging is and always will be a blessing to me. Sister Rose!!!! Oh my gosh…I can’t believe I found you! I don’t know if you remember me or not. You taught me at Saints Peter and Paul Catholic School around 1969, You used to call me Crystal, even though that wasn’t my name. It was kind of your nickname for me. Anyway, you have taught so many kids you probably don’t remember me, and please don’t feel bad if you don’t. You made a huge impact on me and I have never forgotten you. I just wanted you to know that!